A dozen of one, or not. It’s tempting to think that it’s only the domain of modernist composers, theorists and ethnomusicologists to talk of anything but 12 notes in an octave. After all if it was good enough for Mozart and Beethoven it should be good for everyone, right? Well, as it happens, Mozart and Beethoven understood F# and G-flat as different notes. A manuscript survives for example of Mozart’s teaching notes to his English student Thomas Attwood showing the difference between a major semitone (e.g. E to F) and a minor semitone (Fb to F). Almost universally considered as identical today, in his they were pitched slightly differently. Very few musicians are aware that even into the 19th century fingerboard diagrams and scale exercises existed with two types of accidental (e.g. g# as distinct from a-flat) as well as keyboards with split keys so that the player could choose between accidental types. It’s remarkable how efficiently this has been filtered out of the system so that even professional classical musicians and teachers – let alone students – are unaware of our microtonal recent history. 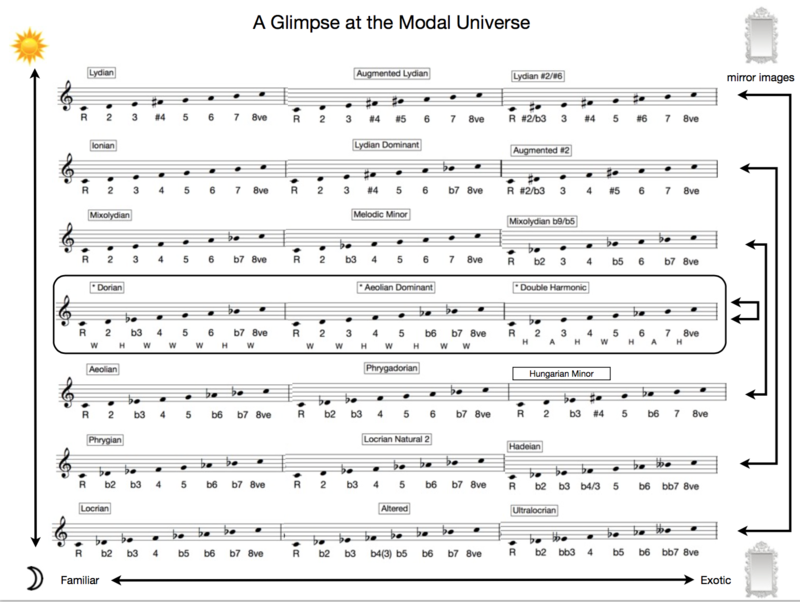 A diagram demonstrating a section of the huge modal universe. You may see how mirroring modes (turning them upside down) can organize them into levels of brightness. It can also identify those modes that are identical in mirror form. These include Dorian (used in a thousand tunes from Scarborough Fair, Shine on You Crazy Diamond, Brick House to The Hitchhiker’s Guide To The Galaxy), Aeolian Dominant (Babooshka) and Double Harmonic (Miserlou from Pulp Fiction). These are just 3 of the heptatonic even-tempered modes with mirror symmetry parents. There are many others, scales with 2-12 notes, as well as scales with ‘twin’ mode systems. Regardless this technique can be applied widely and is a rich resource for composers and improvisers alike. Here’s the interesting article examining inherent ster-convex properties of musical scales. Quite intriguing, will give it its due attention when I can. The solution to the PD/DA/PF puzzle. Yesterday I asked the (unlikely) question if anyone noticed a little musical easter egg I laid in the Pod Delusion tribute to Douglas Adams. The podcast was edited in a way that made it barely audible and the reference is obtuse and lateral but here goes if you are keen to know. The moment is most clearly heard at 56:00 of the pod delusion mp3 track. The Hitchhiker’s theme (actually by the Eagles) that I rearranged is in a mode called Dorian (a particular scale with a lovely characteristic – see here for more: http://www.scribd.com/doc/47614279/An-Introduction-to-the-Wonderful-World-of-… This happens to be the same mode as ‘Shine On You Crazy Diamond’ so in my track as the last chord dies away, you hear a moog playing a little melody with the classic ‘Shine On’ four note guitar motif… What is the melody? The Pod Delusion theme. The reason I did this is that Douglas Adams was a big Pink Floyd fan and as mentioned on the pod delusion special even played bass guitar with them on stage. http://www.youtube.com/watch?v=_Rk6nN-FVi0 which gives it all a nice symmetry. I won’t mention what happens at 42 seconds.